One of the country's premiere marketing and clothing executives, Edwin A. Morris created the world's largest manufacturer of work and recreational clothing during the 1940s through the 1970s in Blue Bell, Inc. Junior Achievement Born in Cabarrus County on Aug. 13, 1903, as the youngest of five children, Morris grew up picking cotton on a farm in Concord, receiving 50 cents for every 100 pounds of cotton he picked. "Once you've done that, everything else is easy," he said in a 1991 Greensboro News & Record interview. "I learned that it's good for you to have it kind of rough." 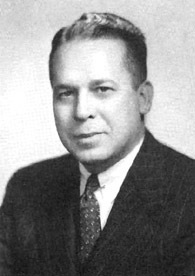 Morris received a bachelor's degree in business administration from Washington and Lee University in 1926. He attended Harvard Business School for one year before leaving to work for a Massachusetts-based textile company. In 1904, C.C. Hudson and associates launched the Hudson Overalls Company in Greensboro on the second floor of a grocery store. After buying out his partners, Hudson renamed the company Blue Bell for his newly trademarked Blue Bell Overalls. In 1918, sales totaled $156,000 and the firmed moved into its own new plant. In 1926, Robert W. Baker's company Big Ben Manufacturing Company (from Jellico and Middlesboro, Kentucky) bought the Blue Bell operation and consolidated headquarters in Greensboro under the Blue Bell Overall Company name. In 1936, J.W. Fox became president and with the purchase of Globe Superior Corporation that year, the company was renamed Blue Bell-Globe Manufacturing Company. The Globe operation had made the first sanfordized garments and fitted overalls -- 4 different pant and bib lengths. In 1937, Edwin Morris joined Blue Bell-Globe Manufacturing as a plant manager in Abingdon, IL. Four years later, he became executive vice president in charge of manufacturing. In 1943, the company reverted to Blue Bell, Inc. after acquiring the Casey Jones Company of Baltimore. By 1947, the firm operated 24 plants. 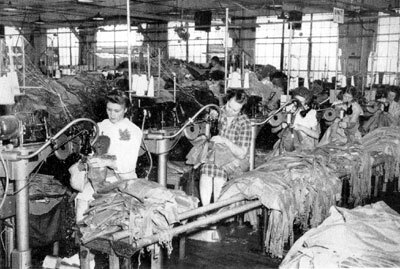 With the end of World War II, all clothing manufacturers turned their focus to civilian markets. In 1948, Edwin A. Morris began president and CEO of Blue Bell, Inc. Morris was a marketing whiz and saw potential in a little used Casey Jones brand -- Wranglers. Blue Bell, Inc. was eager to challenge Levi Strauss and Lee in the Western marketplace. Blue Bell hired Rodeo Ben, the tailor who designed clothing for rodeo celebrities such as Gene Autry and Roy Rogers. Rodeo Ben designed the Cowboy-Cut jean, introduced in 1947, featuring a higher rise for comfort in the saddle, deep-front swing pockets, high-placed back pockets and the Rodeo Ben watch pocket. Blue Bell enlisted world-champion cowboys, including Jim Shoulders, Bill Linderman and Freckles Brown, to wear-test the jeans and endorse the Wrangler brand name. Suddenly, Blue Bell was challenging the industry leaders in blue jeans. Morris also diversified the clothing line to dungarees, shirts, women's jeans, children clothing, western clothing and much more. The firm had $53 million in sales in 1955, making the company the world's largest producer of work and play clothes. He added four new plants in his first seven years as president bringing the total to 28 Blue Bell plants in 7 states by 1955. He was elected chairman of the board in 1966 and remained as CEO until 1971. Until his retirement in 1981, he served as chairman of the board of Blue Bell. In 1980, he was awarded an honorary doctor of law degree from Washington and Lee University. He set up the E. A. Morris Charitable Trust was provided substantial contributions to Duke Comprehensive Cancer Center and Washington & Lee University, and a variety of religous institutions. He died on July 31, 1998, and was survived by his wife, Mary Cannon Morris, and a son, Joseph E. Morris.